The tourism sector has changed for the better. A hotel is no longer just a place to crash in after a hectic day of sightseeing; hotels today are a significant part of your trip, offering interesting insights into the local culture and ambience of the place. This shift of preferences is further fuelled by the sudden rise in unique, exciting resorts and vacation homes. 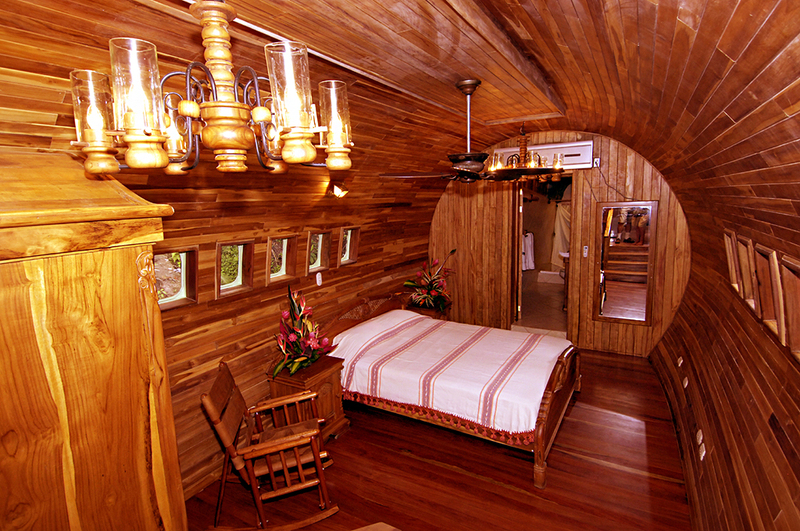 From staying inside small cubicles to flying up in the air and living in a tree-house in a rainforest, the hospitality industry has a lot of quirky hotels for tourists to explore. Located along the coastal rainforest belt and overlooking the Pacific Ocean, the hotel is one of the most innovative lodgings you will ever find in Costa Rica. The exclusive suite is actually a 1965 vintage Boeing 727 aircraft that originally shuttled globetrotters over South Africa and Columbia. The airframe is now renovated as a luxurious 2-bedroom suite, featuring minimalistic designs and expensive furnishing. Set amongst the rich flora and fauna, the place looks less like a luxury hotel and more like a dilapidated airplane jutting out from the jungle cacophony. Read on to know more about Costa Verde and reasons why you should visit the place in this review. 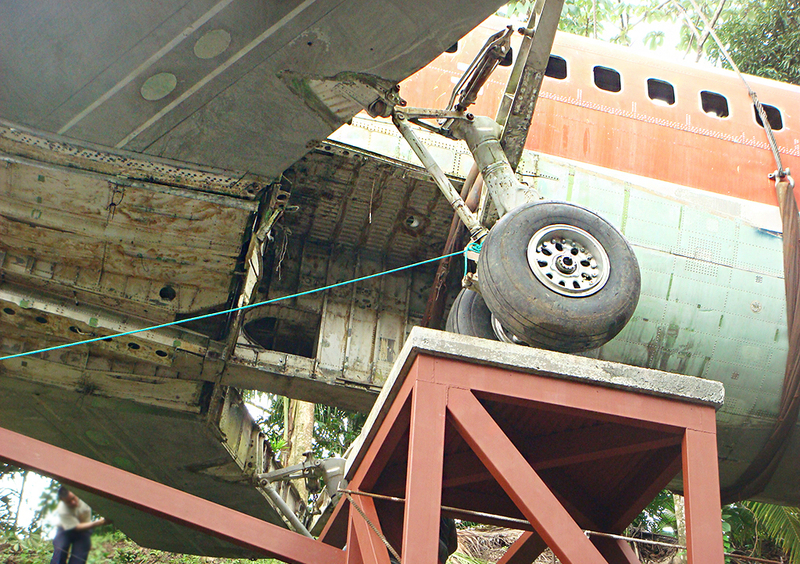 The Hotel Costa Verde is built upon an abandoned 1965 aircraft salvaged from the San Joe airport and resurrected into a classic vintage hotel. The external design and interior décor of the rooms are explained and explored below for you to get a better idea of the place. 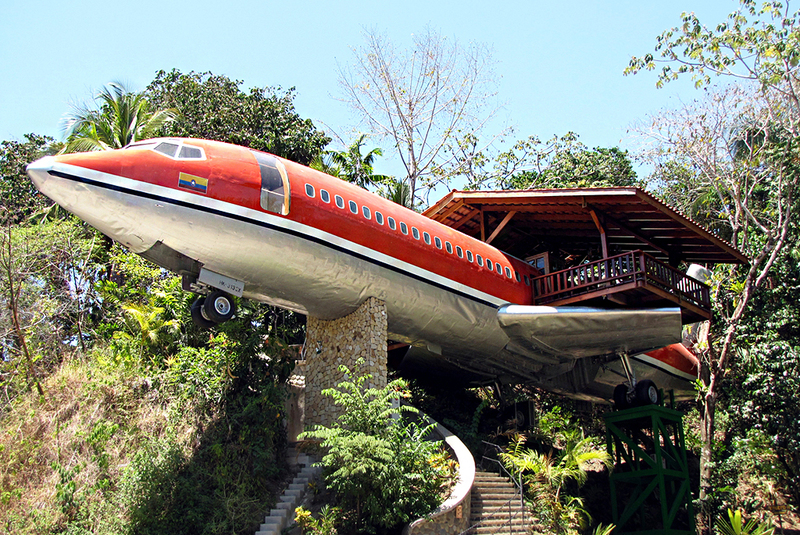 A brilliant example of recycling and creativity, the Costa Verde hotel is built upon an abandoned 727 Boeing aircraft that was rescued and refurbished by the owners from the San Jose airport. It had to be cut into five pieces and transported back to the jungle of Manuel Antonio on trucks. Set about 50-feet from the ground, the hotel overlooks the majestic Pacific Ocean and offers guests a spectacular view of the biodiversity thriving in the jungle. The unconventional jumbo suite is nestled along the edge of the Costa Verde II National Park, perched on a high pedestal for a panoramic view of Nature in her full glory. The handmade wooden furnishings and grand interior décor only add to the credibility of the place. Also, the hardwood deck built on top of the plane’s right wing makes quite an impressive entrance. The teak paneling interiors go all the way up to the tail of the aircraft combining the best of modern facilities and primitive charm. 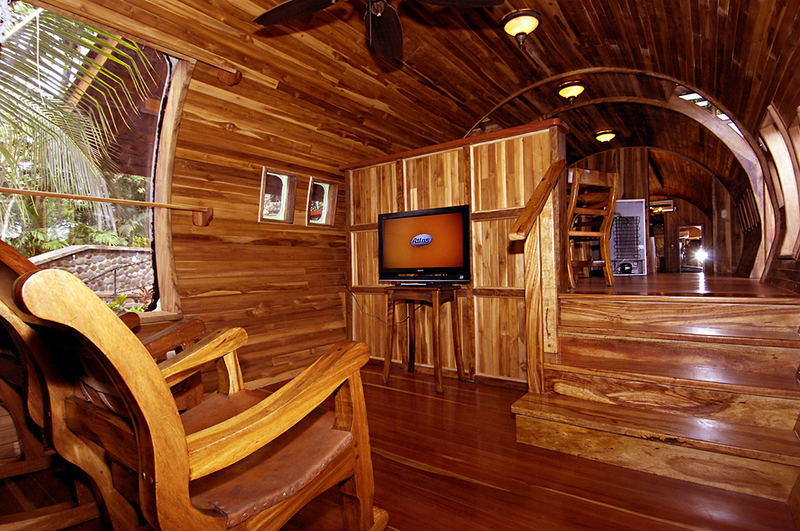 Moving on to the interiors, Costa Verde offers guests simple, cost effective, and minimalistic rooms with handcrafted furniture made from the best quality Costa Rican teak mainly imported from Java, Indonesia. The 2-bedroom, 2-bathroom framework of the hotel makes an excellent holiday home or vacation spot for small families and young couples wanting some peace and quiet away from the struggles of urban life. 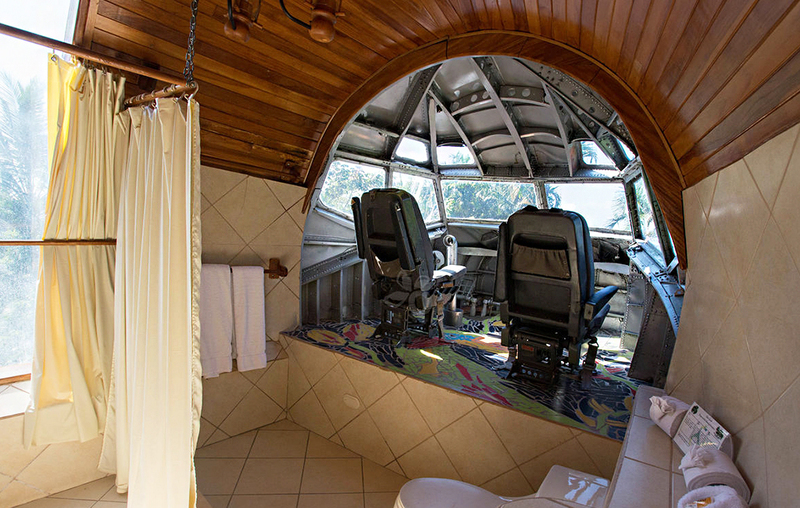 Set on a custom built 15-meter platform, the place gives guests a splendid view of the surrounding biodiversity through the airplane windows and hardwood decks built around the right wing of the plane. Everything in this hotel is made in eco-friendly manner. 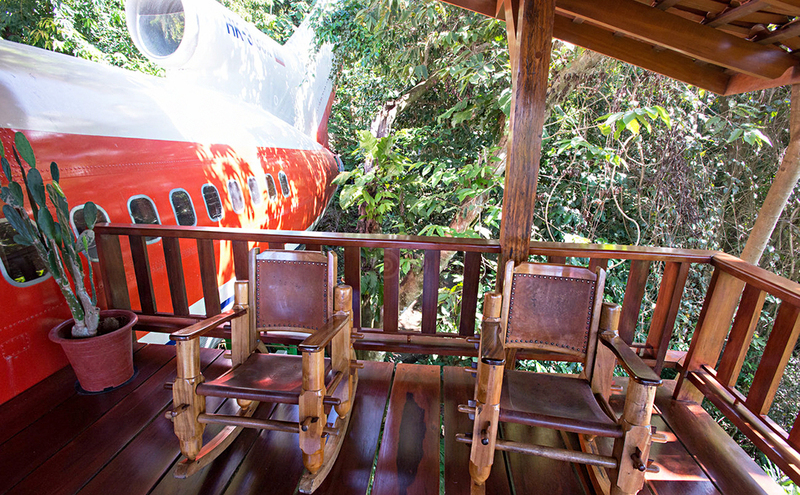 For instance, the wooden chairs and tables are carved out of restored locally grown teak wood. There are three queens sized beds, a beautiful wood-paneled fuselage, two bathrooms, an air conditioner, refrigerator, TV, kitchenette, and safety deposit. Additional amenities include a dining foyer area, an open terrace with ocean view, private entrance pathway up river rocks and a spiral staircase going around the establishment connecting the rooms. Guests can also opt for the non-AC studio apartments with spacious design and glass windows. The bathrooms are clean and spacious with huge glass windows for lots of natural light. You can also check out the luxurious bungalows with private swimming pools and springs, a perfect place for young couples to spend a romantic honeymoon and rekindle their passion. Costa Verde, with its unique structure and innovative design, is a place that offers guests a first-hand experience of the local flora and fauna of Costa Rica. Rigorous outdoor activities, extreme sports or simply lazing around the front porch breathing in the fresh ocean air and soaking up the sun, there’s never a dull moment here at Costa Verde! Also with monkeys, exotic birds, sloths, and toucans for neighbors be rest assured that you will be entertained indoors. 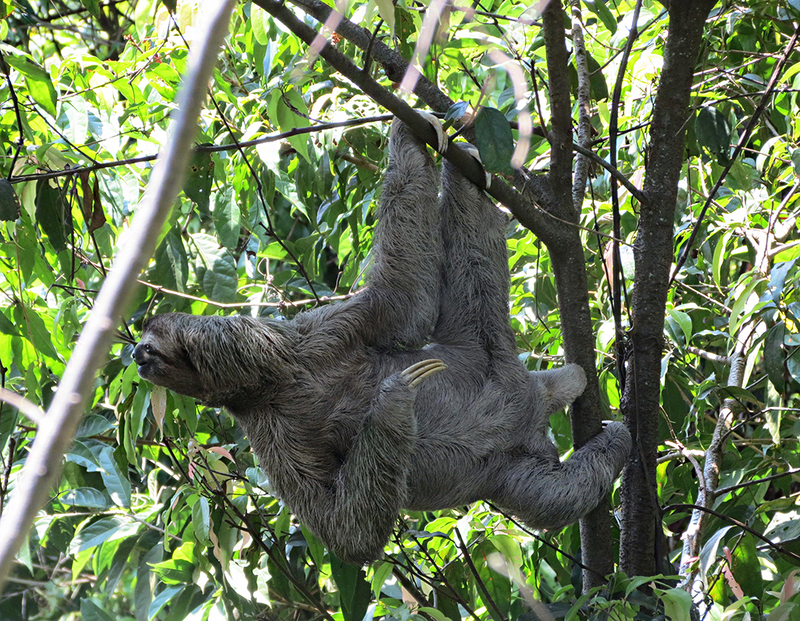 Waking up to the roar of the howler monkeys, watching the white faced sloths slowing making their way up and down the trees, playing with a spider while having coffee are some familiar sights you get to experience at Costa Verde. The hotel is a paradise for bird watchers, nature lovers, and explorers. Lounging on the balcony, having get-togethers in the open terrace or simply observing the many animals and birds in their natural habitat are just some of the many things you can do here to make your stay memorable. There is no dearth of outdoor adventure as well. The hotel provides guests with a local tour guide who shows them all the popular and unknown attractions the place has to offer. Costa Verde is located about three hundred yards from the beach, an excellent opportunity for guests to indulge in water sports such as surfing and scuba diving. The site also has its own Cliffside pools, sundecks, and balconies offering guests a panoramic bird’s eye view of the Pacific coastline and cacophony of the rainforest. Go on trekking trips, mountain climbing or bird watching adventures; guests are free to roam around and explore the natural beauty of the place to their heart’s content. Jet skiing, paddle boating, paragliding, parasailing, mountain biking, whale watching, windsurfing, deep-sea fishing. A short walk downhill and you can catch up on the local communities, shops, and festivities of the nearby settlement. Late night parties, local fairs, and other celebrations give you a glimpse into the lifestyle of the ordinary people in Manuel Antonio. The place is well connected to the Quepos or the San Jose International Airport. The Pez Vela Marinna in Quepos is another tourist attraction you can visit. The place is home to the best seaports and sport fishing activities. The daily charters, cruises and private sails allow you to delve deeper into the marine biodiversity of the ocean. 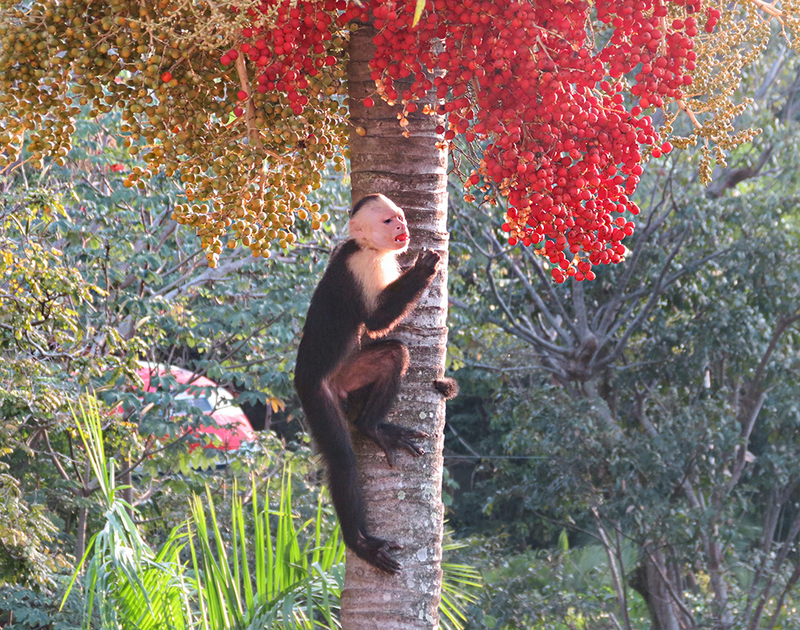 The hotel is also close to the Manuel Antonio National Park, a great opportunity for guests to explore the local wildlife of Costa Rican rainforests. Costa Verde resort comes with an extensive range of accommodation options for guests such as luxurious AC rooms and studio apartments. The property has four local restaurants nearby, offering guests a wide variety of exquisite cuisines to enjoy and savor. The indoor kitchen is simply furnished with a microwave, a coffee maker, induction, and refrigerator in case you want to cook your meals. 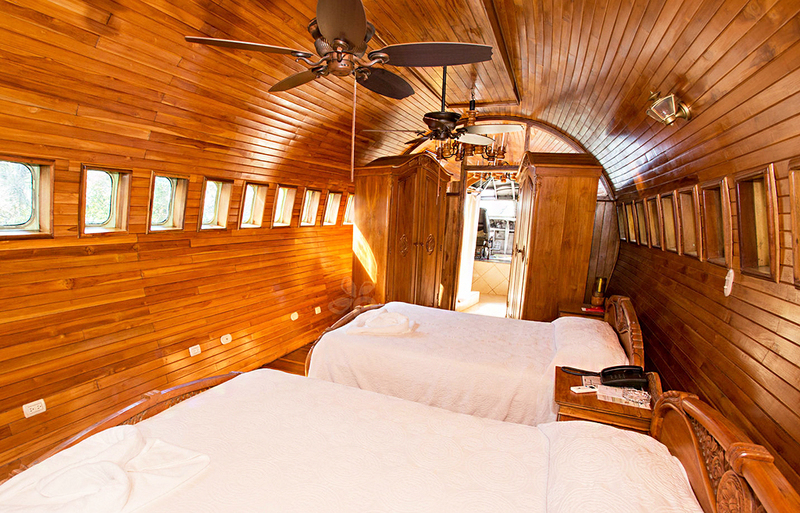 Built upon a 1965 Boeing 727 Aircraft, Costa Verde offers guests the choice between a full furnished AC guesthouse or a cozy studio with cable TV. 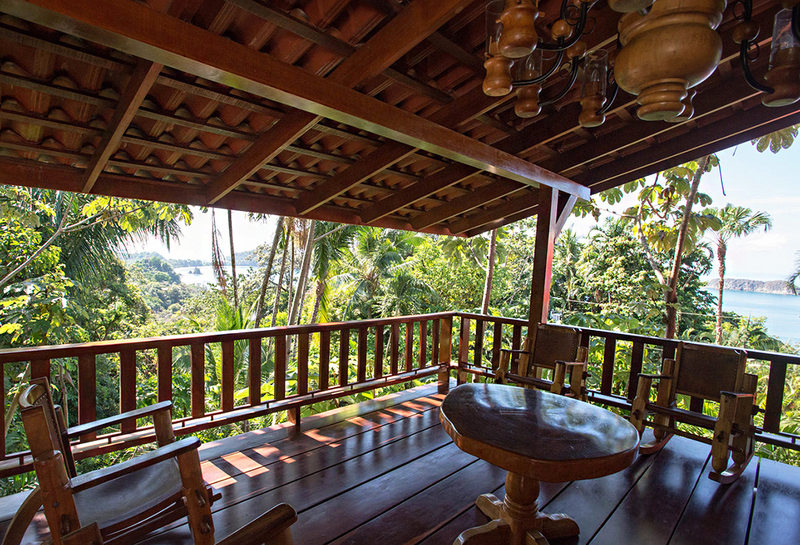 All rooms have a spiral staircase leading up to the terrace and a 360-degree panoramic view of the ocean and nearby jungle. The entire property was renovated and built using recycled teak and hardwood. Also, the structure is immune to wind storms and hurricanes featuring prosaic aluminum terrace roofs that remain sturdy in the most volatile weathers. Other than a vacation home, the resort can also be rented to host weddings, receptions, parties and small get-togethers. The resort has its beauty salon and spa where you can relax, rejuvenate and pamper yourself. The site does not entertain pets and is a non-smoking zone. The place is more of a personal holiday home than a hotel with its spacious bedrooms, luxurious bathrooms, kitchens and dining area. Surrounded by beaches, botanical gardens, marine parks, and hills on all sides, the Costa Verde resort is paradise on earth.